I fully admit I’m not a big fan of standard hot dogs but hand me a quality frank with creative toppings and I’ll savor it just as much as a good hamburger. Cue the banh mi hot dogs. There’s a restaurant in town called Good Dog Houston that serves quality hot dogs with an array of creative toppings. I have my favorite combinations that I order every time I go but once in awhile they’ll offer a special combination that gets my attention. One such special was the banh mi hot dog. My love for banh mi sandwiches runs deep so I was all in when I saw that special offering one day. Unfortunately, I’ve only been able to catch it on their menu one time. I keep hoping it’ll show up again but it’s been a couple of years and I have had no such luck. So, I decided I needed to make banh mi hot dogs happen on my own. 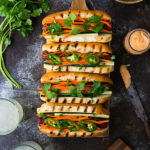 The essentials of a good banh mi sandwich are really easy which means making these banh mi hot dogs requires barely any more time than making basic hot dogs. You just need quality meat, pickled carrots, some cilantro and a good roll to hold it all together. Start with a really good all-beef frank. The quality of the meat will make a huge difference as does the quality of the bun. I like to use a soft and fluffy hot dog bun such as a brioche bun or King’s Hawaiian hot dog buns. Then add your banh mi inspired toppings and you’ve got a hot dog that even adults will enjoy. Whisk together rice vinegar, sugar, and salt in a small bowl. Add carrots and toss until combined. Let stand at room temperature for 15-30 minutes, stirring occasionally. In a small bowl, stir together the mayonnaise and sriracha until evenly combined. Set aside. Grill the hot dogs directly over medium-high heat, turning often, until lightly charred and plump, about 5 minutes total. Move the hot dogs to indirect heat to keep warm while grilling the buns. Brush the insides and outsides of the buns with melted butter and grill, cut sides down, until lightly toasted, about 1 minute. Turn the rolls over and grill for about 30 seconds more. Serve each hot dog on a bun with desired amounts of pickled carrots, sriracha mayonnaise, jalapeño, cucumbers, and cilantro.